Deep in the woods in an old white cabin, three friends make their pumpkin soup the same way every day. The Cat slices up the pumpkin, the Squirrel stirs in the water, and the Duck tips in just enough salt. But one day the Duck wants to stir instead, and then there is a horrible squabble, and he leaves the cabin in a huff. It isn't long before the Cat and the Squirrel start to worry about him and begin a search for their friend. 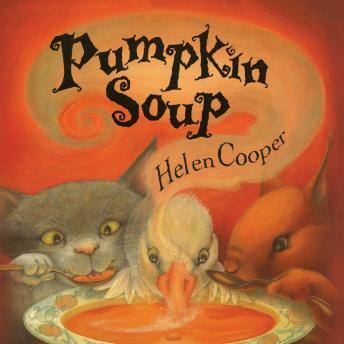 Rendered in pictures richly evoking autumn, Helen Cooper's delightful story will resonate for an child who has known the difficulties that come with friendship. Included at the end is a recipe for delicious pumpkin soup.